Description: Glamorous and vintage-inspired, this mermaid wedding dress offers additional coverage to our original Brinkley style. 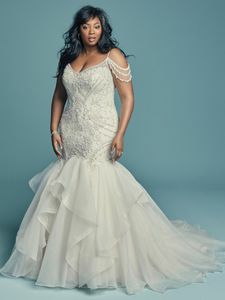 The tulle bodice is accented in beaded embroidery and Swarovski crystals, while beaded illusion cold-shoulder sleeves complete the sweetheart neckline and V-back, also trimmed in beading and illusion. Fit-and-flare skirt comprised of tiered Chic Organza trimmed in horsehair. Finished with crystal buttons over zipper closure.